Rooms offer exceptional grace and comfort and all give views over either the hotel’s central courtyard terrace or the Beit Al Mamlouka Hotel Damascus’s terraces. Suites range in size but the largest and most famous is the Suleiman Suite. Large, pampering bathrooms in mosaic style marble and tiles echo the Mamlouk period of the hotel's origins. All rooms of Beit Al Mamlouka Hotel Damascus has a custom-built entertainment that includes a television with satellite channels and the Internet. Rooms are fitted with air-conditioning units for the summer months. Each room has been awarded a different name and is decorated in its own style reflecting the period of history. Below is a little description about the historical significance of each room. 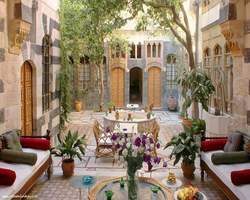 The Beit Al Mamlouka Hotel Damascus consists of 8 bedrooms (two singles, two doubles and four suites), with a courtyard, terraces and private patios. The Beit Al Mamlouka hotel features an Old Bayke (stable) converted into a gallery, restaurant . On show on the walls are local art exhibitors for sale and hand painted verses of old Arabic poetry drawn on it. This little gem of a boutique Beit Al Mamlouka hotel in the heart of Damascus can also be hired out in its entirety or for official functions such as dinners and wedding receptions.